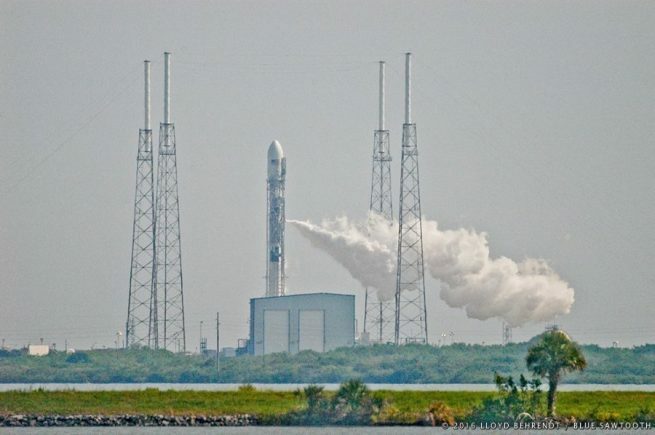 CAPE CANAVERAL, Fla. — SpaceX encountered a serious anomaly during the static test fire of the Falcon 9 rocket tasked with carrying the Amos-6 satellite. According to the 45th Space Wing, the accident occurred at 9:07 a.m. EDT (13:07 GMT) with images of billowing black smoke and flames appearing on social media outlets such as Twitter. Then, as now, people were ordered to remain indoors. The Full Thrust Falcon 9 utilizes relatively benign sources of propellant (RP-1 – a highly refined form of kerosene and liquid oxygen) Additionally, it appears the Amos-6 satellite was attached to the rocket and therefore lost. Typically, orders to remain indoors are issued for when hypergolics, which do appear to have been on the Amos-6 satellite, are used. This is the second accident that SpaceX has encountered in roughly the past 14 months. 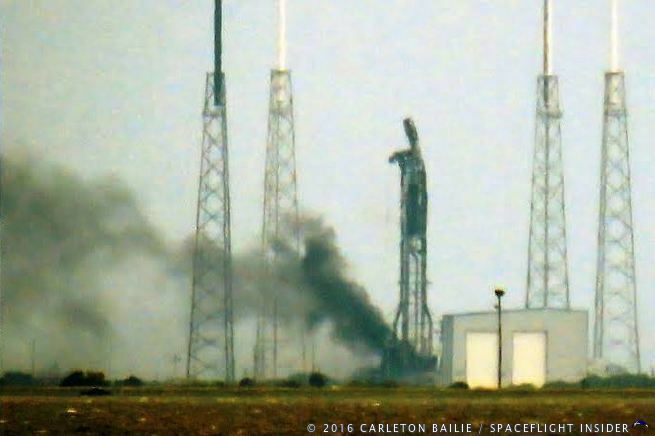 On June 28, 2015, a SpaceX Falcon 9 rocket and its CRS-7 Dragon spacecraft cargo were lost 139 seconds into the flight when a strut holding a helium tank in the rocket’s second stage failed. In terms of Amos-6, the mission would have seen the Falcon 9 rocket place the satellite in a geostationary transfer orbit. The satellite, the second to use the Amos-4000 platform, was planned to have an operational life of about 15 years. Amos-6 was built by Israel Aerospace Industries and, according to Space News, would have seen Eutelsat pay some $95 million over the course of about 5 years for the lease of Ka-band spot-beam broadband capacity. Estimates by Spacecom placed the cost of launching, insuring, and operating Amos 6 for a period of about a year at around $85 million. According to a report posted on Globes, the satellite itself cost about $200 million to produce. At present, it is not known how much damage Space Launch Complex 40 has received or how long it will take to repair. Stay tuned to SpaceFlight Insider as we work to provide you with more information about this breaking story. By this logic, the expensive rockets of the 1960s-1980s should have been very reliable. They weren’t. But if low cost is achieved by cutting corners, this sort of anomaly can result. I have received anecdotal remarks from someone stating he knows people that work at SLC-40 for SX and that SX “plays fast and loose” there. Hopefully this is not the case, but if so, I do hope any investigation reveals such activity or mindset or corporate culture and corrects it before we start putting humans atop F9. SpaceX is apparently trying to achieve low costs primarily through hardware simplification (for example, by use of common engines or common tankage structures). I hope you don’t consider this to be “cutting corners”. Reports that the anomaly took place ‘a few minutes before’ ignition may indicate a problem on the pad or with pre-firing prep/fueling not strictly related to the launch vehicle. Only careful investigation can determine the cause. Just learned Elon Musk says the initial explosion seems to have originated somewhere in the upper stage oxygen tank area during propellant fill operation. In the video it appears that the explosion originated just below the payload fairing at the top of the second stage. The second stage also appears to have in the fueling process is well. Forgive my ignorance, but if this was to have been a static fire of the first stage, then why fuel the second stage at all? Additionally why have the payload /fairing mounted for a test of this type? Most liquid fueled launch vehicles conduct what is known as a “wet dress rehearsal” where the vehicle is completely fueled and prepared for launch, but it is not launched. This is done to verify that all systems are in order / prepared for the mission. So a pre-launch “fueling test” or “fueling rehearsal” is pretty standard in the industry. I am not aware of any other rockets that “test fire” their rocket engines prior to the mission. But it is what Space X has been doing from the beginning. I am not aware of the pre-mission test firing ever creating / causing problems. If anything, they may very well have uncovered issues in the past. Fueling the 2nd state would be part of such a wet-dress rehearsal. Regarding payload / fairing mounted for this type of test… that would seem to go towards time required to mount the payload and perform pre-launch checks. Most vehicles with which I am familiar will conduct the wet-dress rehearsal after everything is mounted / checked out etc. With Falcon 9, I believe the would, at a minimum, have to re-lower the F9 down from the launch position to a horizontal position then take it back into the hangar to mount the payload and the fairing. Then you have to roll it back out and re-erect it on the strongback. Sounds like more chances for something to go wrong putting it up the first time, taking it back down, then putting it back up. Are you sure AMOS-6 would have hypergols on board? I had read that it was intended to be the first fully electric spacecraft in the AMOS series. The words “typically” and “appear to have been” – should provide you with the answer to your question. Was there no pad abort installed on this unit? No pad abort for non-human payloads. Mission would be to high energy GTO so no margin to put pad abort/recovery system in the first place. And even if there were comm sats don’t like being accelerated at 9Gs then splashing into the ocean on parachutes. The Amos-6 had electric station-keeping thrusters. But its apogee motor was an Airbus S400. This is a pressure-fed 100 lbf engine that uses hypergolic propellants, specifically Hydrazine and MON (Multiple Oxides of Nitrogen). MON is a mixture of Nitrogen Tetroxide (N2O4), Nitrous Oxide (NO2) and Nitric Oxide (NO). Based on the mass of the satellite, the propellant mass for the apogee motor was probably somewhere between 2 and 3 tons. Hazmat precautions were definitely indicated.